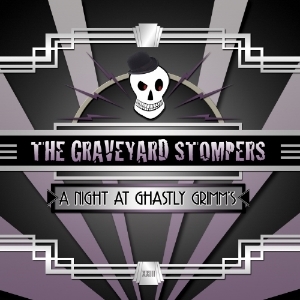 "A NIGHT AT GHASTLY GRIMM'S"
WHO ARE THE GRAVEYARD STOMPERS? The Graveyard Stompers is a unique and highly-talented 8-piece ensemble custom made to fit your Halloween season entertainment needs. More than your typical bar band, The Graveyard Stompers not only play, but PERFORM each piece with electricity and energy that is truly infectious! Experienced, veteran performers and "Fresh Blood" have come together to create a sound that is both solid and edgy. The Graveyard Stompers are ready to wake the dead! With male and female vocals, guitars, bass, drums and horns all stomping, the night is sure to be EXTRAORDINARY! Dressed to kill, The Graveyard Stompers create an atmosphere, maintain a mood and stay true to the theme through a KILLER song list, captivating performers and interaction with the audience. They are sure to put a smile on your face and a chill down your spine. If you are looking for a memorable music experience, then The Graveyard Stompers is the band for you!